CORAL, The Reef & Marine Aquarium Magazine, has been named Hobbyist Magazine of the Year in a Niche Media awards ceremony in Charleston, South Carolina on February 26th. 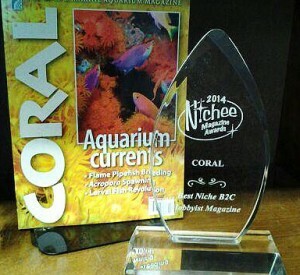 CORAL with its first Nichee Magazine Award. Likened to an Oscar for smaller publications, the Nichee Magazine Awards recognize excellence in content, visual presentation, and publishing acumen. CORAL is published in the small town of Shelburne, Vermont, but reaches an estimated worldwide audience of 37,000 readers, primarily in the United States and Canada, but with distribution in the UK, Australia, Scandinavia, South Africa, India and beyond. The current incarnation of CORAL was launched in 2009 and is the official English-Language Edition of the German title KORALLE, originally created by Publisher Matthias Schmidt and Founding Editor Daniel Knop in 1999. One of Europe’s leading periodical and specialty book publishers, Natur und Tier-Verlag GmbH of Muenster is the parent company of KORALLE and is known for publishing the work of authoritative authors, with bold graphics and arresting nature photography. According to Lawrence, the American-produced edition is now the leading marine aquarium magazine in the world, covering the science and art of keeping saltwater aquariums, as well as exploring coral reef biology, species and environments. The magazine appears bimonthly and is sold by subscription as well as single copies in print, digital and mobile app formats. The Nichee Awards are presented annually by Niche Media, based in Sacramento, California.